Despite the UK's ingrained love of pubs, it's perhaps surprising that no British sitcom has taken hold in our collective psyche in the way that Cheers succeeded in the US. Early Doors has maintained its appeal, as evidenced by its recent resurrection on stage after several years away from the telly, but in its sodden wake lies shows such as the wholly forgotten World of Pub while even Al Murray couldn't quite nail the formula with his Pub Landlord's Time Gentlemen Please. 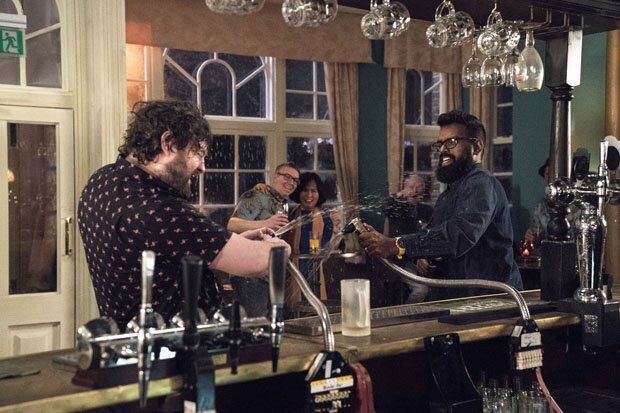 Now having smashed it (his phrase) as a stand-up, travel documentary-maker and hip hop podcaster, Romesh Ranganathan steps gingerly into the breach with his semi-autobiographical show, The Reluctant Landlord. With his father having left the family pub to him in his will, Romesh is less than delighted given that it takes him away from ignoring his kids at home as he attempts to pursue a DJ career. More of a competitor than a mentor to his son (they squabble over console time), he at least does have a semblance of a relationship with his wife (Sian Gibson) though this usually degenerates into caustic barbs and ill-judged banter. Within the pub (The Seven Swans) itself, he attempts to do as little as possible but that strategy seems destined to fail when his dad's bigoted old pal, Dirty Harry (Phil Davis) returns from exile (in choky) brandishing a heap of funny money (OK, Scottish £20 notes) and menacing anecdotes that have everyone on edge. Among the fine comedy cast are bar manager Yasmine Akram (you may recall her as Sherlock's plus one to Watson's wedding), barflies Nick Helm and Marek Larwood (he of We Are Klang fame) while Alison Steadman shows up in a later episode. There's a fair smattering of laugh-out-loud moments (mainly revolving around white liberals being unwittingly racist) in the opening couple of episodes which, in truth, is a higher success rate than most recent UK sitcoms have achieved. But most of all, it's very enjoyable to see Ranganathan virtually dropkick his sarcastic and incredulous onstage persona straight into a sitcom without missing a sardonic beat. The Reluctant Landlord starts on Sky One, Tue 30 Oct, 10pm.